Tour Irkutsk . . . . Weather: Partly cloudy, occasional sun and warm. We have a nice lazy morning, laying in bed until almost 10 AM. Then it is time to get up, have a shower and eat some breakfast. After breakfast, we check our emails and the get ready to head out. We have a large package containing all our camping equipment that we want to mail back to Malaysia and we want to sort this out in Irkutsk so we do not have to carry it any more. Sergey is a big help in calling around to various post offices and courier companies, but in the end we just have to go to the post office to find out what to do. Sergey takes us to the local post office, which is contained near the town center in the first floor of one of the apartment buildings. We get the details on how much it will cost and what forms we need to fill out. We will need to arrange for the packaging and return with it tomorrow. So, we find out that in Russia the most common way of mailing such packages is to sew them up in material and send them off like that. Next stop is therefore the hardware store to get a few meters of cloth (looks just like white bed sheets). Once all this is completed, Sergey shows us where the bus stop is and how to take the taxi buses. Finally, after about an hour and a half, we are heading down town in one of the mini-vans that cost us about 30 cents each (no matter what distance you go). 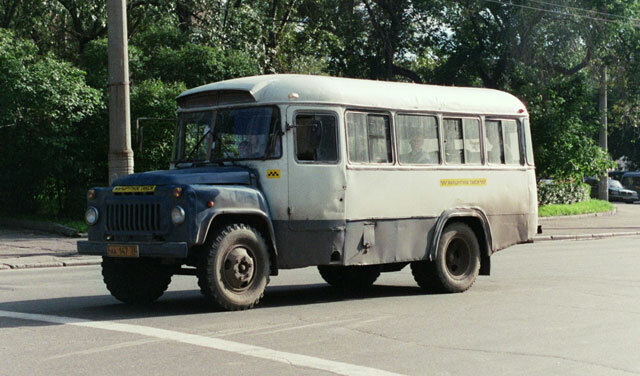 We get off at Kirova Square and begin our sightseeing from there. First stop is at the World War Two (The Great Patriotic War) memorial behind the bland regional administration building (formerly the party headquarters) and built on the site of the demolished magnificent Annunciation Cathedral. 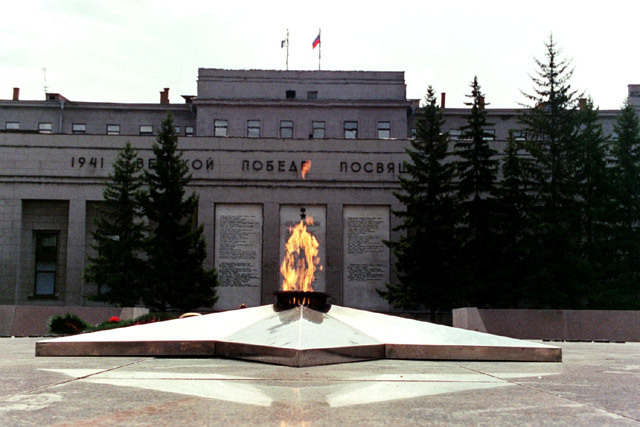 The memorial is, by Russian standards, quite simple and it has just been added onto the back wall of the building with an eternal flame in front. Located around here are the Church of the Savior (now a museum - which we passed on), the Epiphany Church and the Polish Catholic Church. There is also a new church that has just recently been completed. For a new church, this is one that the Russians have actually done quite a good job in designing and decorating. 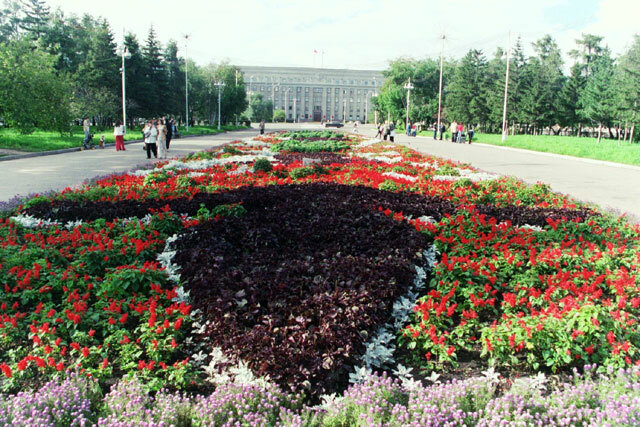 From here we wander down the length of the large Kirova Square, past the Hotel Angara to Karla Marxa street. This is the main drag in the city and we wander up along it to check out what it has to offer. They seem to be spending some time and money in sprucing it up and restoring some of the old buildings lining the street. In fact, some of these old buildings are well worth keeping and restoring and we are glad to see that they are doing this. We stop in at a recommended bakery and while it is not quite up to the glowing review, we get a few decent snacks. We now pick one of the perpendicular side streets to wander down to make our way towards the Decembrists Houses. We end up picking a great street to cross over to the next street. 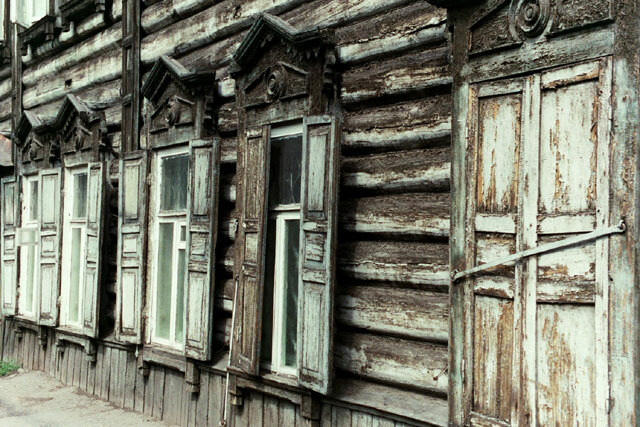 It is filled with the old, typical Siberian wooden houses. While this street is not mentioned in any of the guidebooks (which recommend viewing some other wooden houses that do not even come close), it has some of the best selection of these wooden houses. 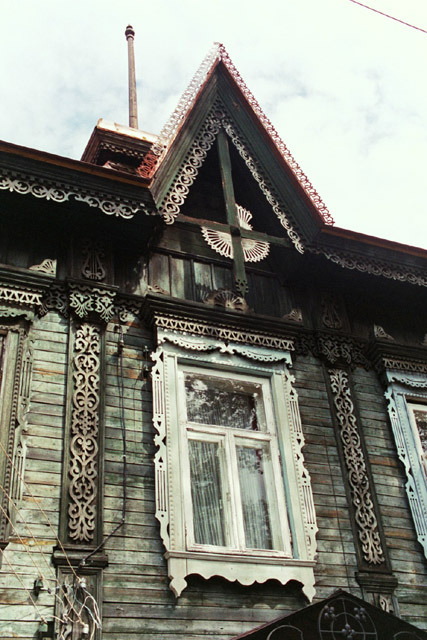 The traditional wooden houses in Siberia (and Russia) are decorated with wooden window frames and trim that are often exquisitely carved. They must have spent the dark, cold winters in the carving of these magnificent decorations. House after house on this street are just wonderful examples of this wooden architecture. They are in varying state of repair. Some look solid, while others look like they are ready to tumble down in the lightest wind. But we are not sure what the future is like for these houses - especially without proper maintenance, they must be drafty and cold and require lots of money and time in upkeep. If possible, we are sure that most occupants would want to move into a modern concrete structure. Will they be protected? Who would pay for their preservation? Only time will tell and if time drags on, many will just collapse from lack of care. We soon reach Dzerzhinskovo street and turn left and make our way up to the Trubetskoy House, which is now a museum. Prince Sergey Trubetskoy was one of the Decembrists, who after the failed 26 December, 1825 mutiny, were exiled to Siberia to serve out sentences of hard labor. Once they had finished their sentences, many of the Decembrists settled in Irkutsk with their wives and families. And that, in itself, is a touching story. Many of the wives of the Decembrists, all rich aristocracy with very comfortable lives, decided to join their husbands in exile, in the process being forced to give up all their possessions and even any children they may have had at the time of exile. Despite this, and extreme hardship, many of the wives joined their husbands in exile in Siberia. 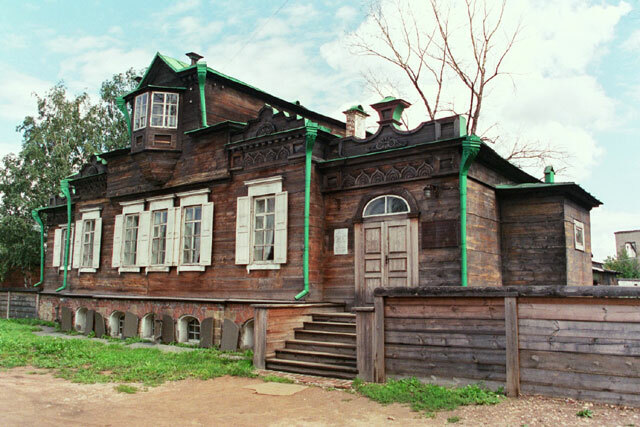 The Trubetskoy House is made of wood and is relatively modest given the original stature of the prince. It has been well designed and laid out. The museum is complete with some of the original furnishings and exhibits about the Decembrists and their life in exile. The visit to the museum is very nice as included in the entrance ticket is an English language tour. From here we head over to the other Decembrists house owned by Volkonsky, but the museum is closed today. This building appears to be much grander and we hope to see it on another day. From here we walk by the exterior of the simple Church of Transfiguration and begin the long walk to the Znamensky Monastery. We soon leave the old part of the city and the walk becomes much more unpleasant along dusty roads lined with ugly concrete structures. 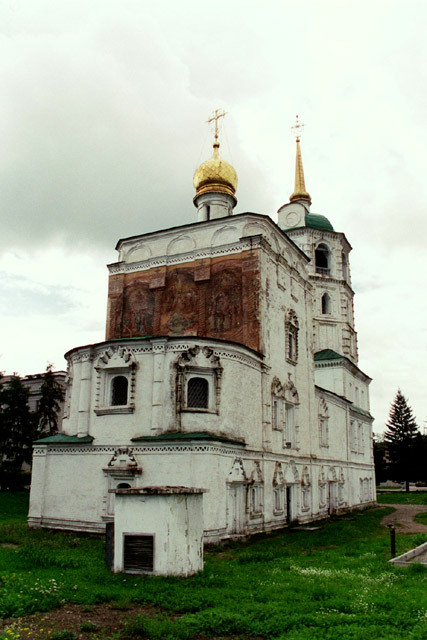 The Znamensky Monastery was first built in 1763 and was restored by exiled nuns after WWII. It is a peaceful sanctuary in an increasingly noisy and bustling city. 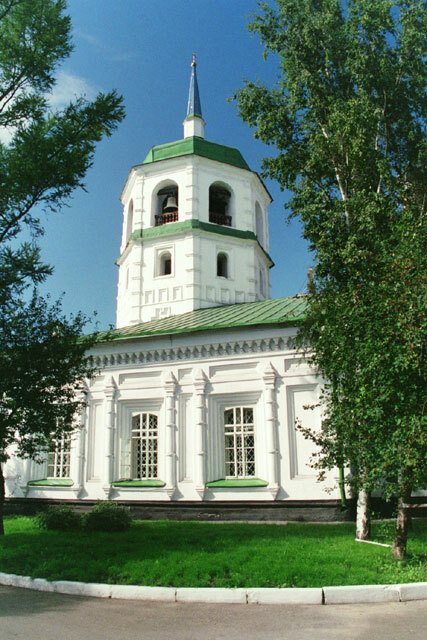 The remains of St Innokent, a Siberian missionary, are buried here and is a source of miracles. Shortly after we enter, a service is about to begin, so we take a quick look around and then sit in the back for the first part of the service. The services here are full of rituals and very involved with lots of chanting and singing. The bells tolled for quite some time. After a bit of a search, we are able to find the graves of Princess Trubetskaya and three of her children. We then begin the long and dusty walk back to Kirova square. Once we get back to the square, where we began the day's exploring, we are hungry and thirsty, so we go in search of a restaurant recommended by our hosts at the home stay. It was not easy to find, dark an alley and tucked behind a corner with a small door that led down some dark stairs into a basement (and only a small sign in Russian), but it was well worth the effort. Excellent place - service nice and friendly, some English on the menu and the food and drink turned our great. 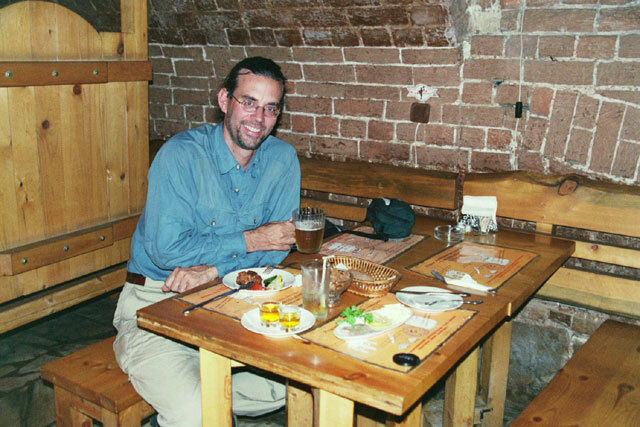 We had the raw omul (the local Lake Baikal fish) and the Siberian pelmini (meat dumplings in a broth with a bread crust), washed down by a beer. The best part was that, when food was ordered, they offered a large shot of their home brewed spirits. The spirit was surprisingly smooth and had a very nice flavor. When we finished that, she was kind enough to offer another round on the house. We were a bit early, so we pretty much had the place to ourselves, but it still felt very cozy. In the winter, it must be an excellent escape from the snow, cold and wind outside. Once we finish our snack and drink, we head back out to explore further. We decide to head over to the central market, walking back down the length of Kirova square, but this time turning left earlier to check out the circus, which is nothing special from the outside. Along the way, we check out the many kiosks selling everything from beer to snacks to smokes. The variety of cigarettes (but not as many varieties as there are for beers) for sale is amazing. From there, we turn right and head on, crossing over Karla Marxa on our way to the Central Market. The market is fantastic - they have everything on sale here. Whatever food you want, you can find. And it looks fresh. They have a large bread section and dry goods section. The eggs are stacked up in many stalls in a far corner. Fruits and vegetables are in abundance. Fish, of course, takes up a large portion of the market. There is Russian champagne and vodka, caviar by the kilo, sausages hanging from the ceiling by hooks, cigarettes and cigars and tobacco, drinks of all sorts. It is a huge market and we just wander around taking in all the sights and smells. Even though we just had a light snack, the smells get our stomachs churning. We head over to the section selling freshly cooked food and get a few snacks each. It is now time to start heading back. But first we want to check our emails, so we go in search of an internet cafe. One marked on the map as nearby, is now closed, so we walk the length of Dzerzhinskogo to the Philharmonic Hall and Lenina street. A short way up Lenina, we find the internet cafe and quickly check our email. Once we have finished that, we have another quick bite to eat and then have to figure out how to get back to our home stay, a distance away across the river. There are so many mini-taxis running here and there that it was useless to give us the numbers of the different buses, so we need to try to keep our eye out for the name of the area. Fortunately it is a long word and has the identifiable word in Russian for "academic" in it, so we quickly wave one down that we think is going in our direction. The driver seems to conform this, so we hop in and take our seats at the back of the van. We are heading in the right direction, and soon we are arriving at our stop. We pay our 7 roubles and hop out. A short walk later and we are at the home stay. Once settled back in our room, we spend a while working on our journals and preparing the bag to mail our stuff back home. We have brought the material and Jacqui begins the long and laborious process of sewing the material to fit the bag. About half way, we decide to stop, as we are not sure if they will want to look at the contents at the post office. 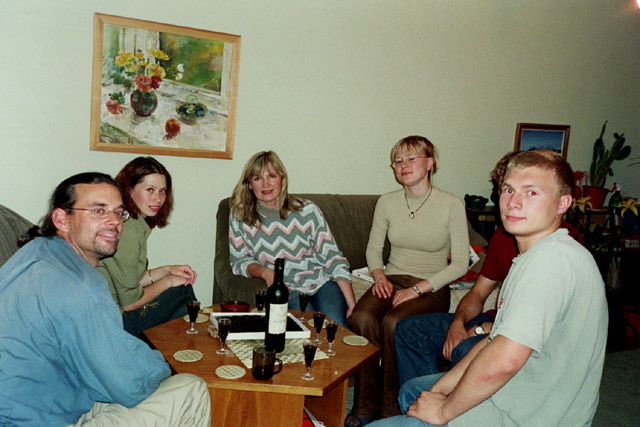 As we are in the middle of our preparations, the host comes and invites us into the living room, where they are having a small celebration among family and friends. It appears that their friend has just gotten a new job and they are celebrating this. There is all sorts of food and snacks and a bottle of Georgian wine. We all sit around the small table and while we dig into the delicious food, have numerous toasts with the wine. It is a very nice time. After that, we get ready for bed and retire for the night.